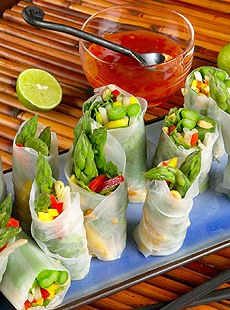 Asparagus Spring Rolls With Sweet Red Chili Dipping Sauce are a fresh, healthy vegetarian lunch option. Photo courtesy California Asparagus Commission. Spring rolls may seem exotic, but they are easy to make and always a crowd-pleaser. Serve them as a first course for dinner and as healthy snacks and cocktail snacks. This is Page 5 of a 12-page article. Jump to the recipe below. Click the black links below to view the other pages. Recipe yields 18-24 rolls. Note that this type of unfried roll in rice paper a summer roll, whereas spring rolls have a dough wrapper and are fried—a thinner version of egg rolls. See the difference and take a look at another spring roll recipe. To prepare filling, blanche asparagus in boiling salted water until tender to the bite, 3 to 5 minutes. Peel and julienne mango or papaya and ginger. Julienne bell pepper. Set aside with remaining filling ingredients. To assemble, fill a large bowl with hot water. Working with one wrapper at a time, slip rice paper wrapper into water until pliable, about 1 minute. Place wrapper on cutting board. In the center, put 3 to 4 asparagus spears with the tips coming off the end of the wrapper slightly, 3 to 4 mango or papaya slices, 3-4 pepper slices, 3 tablespoons sprouts, 2 tablespoons herbs, and a sprinkling of ginger and peanuts. When ready to serve, slice wrappers into 3 segments each and stand upright on a serving platter. Mix chili sauce and lime juice together. Serve alongside the rolls as a dipping sauce.